Restoration and after – another phase of persecution. As a consequence of the ejections of ministers in Scotland there was a steady flow of Covenanter ministers across to Ireland. No less than six of the ejected Galloway ministers settled in the Presbytery of Down. Rev Mr Archibald of Wigton followed Mr Ramsay at Bangor; Rev Mr Kennedy of Leswalt near Stranraer followed Mr Gray at Newtownards; Rev Mr Patrick Peacock of Kirkmabreck followed Mr Richardson at Killileagh. Others who came were – Rev George Waugh, of Kirkinner, Rev Alexander Ferguson of Sorbie, and Rev John M`Broom of Portpatrick, these also settled in Co. Down. But the Restoration of Charles reverted power to the Episcopalians and the vitriolic, even vicious, attention of the bishops. Dungannon for alleged `non conformity`. into a rebellion in which they generally wanted no part. Lieutenant, several of the ringleaders were seized. suspicion that other ministers had been involved and there followed another period where the Bishops pursued the Presbyterians for ` non compliance`. Not least among the plois adopted by the prelates was the `hint` that Presbyterians were basically disloyal – such was the tenor of the allegation (left) made by Bishop Jeremy Taylor in 1667 (shortly before his own death, seen by some as divine retribution !) and recorded in the Montgomery MSS p 248. Presbyterian church, with some breaks, until 1869.
of Scotland who followed Richard Cameron and James Renwick. Presbyterian Church in Ireland grew. with an organised body of church government to guide them. both in England and Ireland. magistrates `Romanised`. The Army too was `cleansed`. wife Queen Mary ( daughter of James II) took his place. resistance to a King determined to expunge the Protestant religion. The subsequent siege of Derry lasted 105 days. Cunningham William Cairns, and Samuel Harvey. the advice ” Shut the gates and keep them out “. the Jacobite Viscount Mountcashel at Newtownbutler. recognised William III as King of Ireland. continued their vindictive actions against Presbyterians. 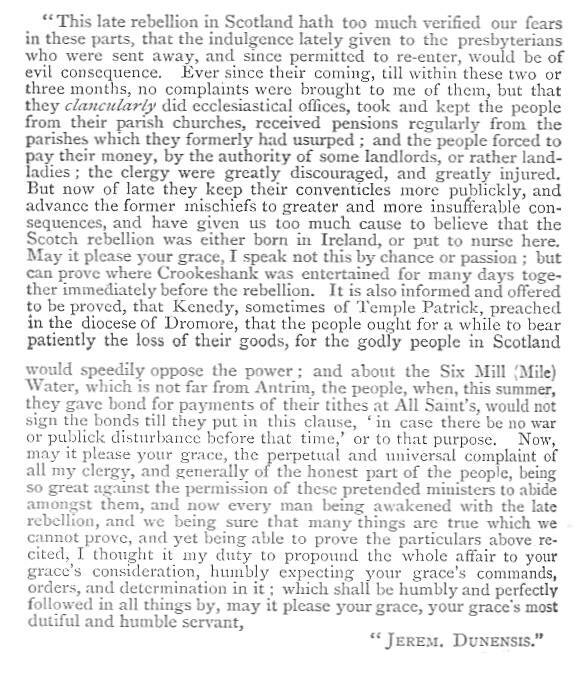 Such was their petty vindictiveness of the episcopal bishops that the Presbyterians of Ulster were driven to to make “A Petition of the Presbyterian Ministers and People in the North of Ireland” to William and Mary, praying that the Lord Lieutenant put a stop to the activities of the bishops and their officers who, despite the orders of the Civil Courts, continued to curtail the liberties of the `Dissenters`. others unless the English Test Act was brought into play. pushed these people into becoming “God`s Frontiersmen”.